GeekTonic: Amazon Kindle at $260 – What’s the Sweet Spot for eBook Readers? Amazon Kindle at $260 – What’s the Sweet Spot for eBook Readers? Last week Amazon again dropped the price of the Kindle 2, this time to $259. They also announced an “international” Kindle just like the Kindle 2 for $279. I’ve commandeered my wife’s Kindle 2 for the past several weeks (I take a bit longer to get through books than she does) and I have to say I really, really like it. Matter of fact I’m 100% sure I’ll be purchasing an eBook Reader for myself in the next six months whether it’s another Kindle or possibly a competitor like the Plastic Logic device or something else. I just love the concept of eBooks and having used one in the past month so much I want one for my own now. What’s your eBook Reader Tipping Point? So I was wondering what others are thinking? 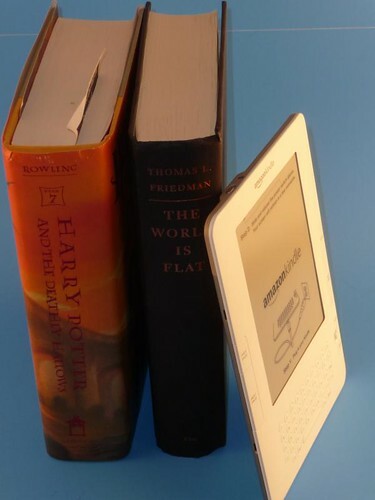 eBook readers are supposedly going to be very popular gift items this coming holiday season so are you considering one? What’s your magic price and/or feature that would push you over the edge? Want to Check out the Kindle 2? Read the two GeekTonic reviews: one I did from a geek’s perspective and one from my wife’s perspective as a hard-core reader’s perspective.